An interesting course and an excellent opportunity to get away from the build up the Christmas. Hardley results are below. You can see the full results here. Mick Anglim writes, "Thanks to everyone who turned out this morning to brave the cold. Fortunately the rain held off and the underfoot conditions were reasonable. Congratulations go to everyone who ran and particularly to those in fancy dress. Dave & Jenny Jewell in their Saint and Sinner costumes and Paddy Butler as King Kong deserve special mention but Caroline and Julie in their 3 legged Santa costume ran them close! Princess Mary, Adrian Hood, Superman Lee and the various Santas all joined in the festive spirit. Special thanks go to Sam and parents for the mulled wine and mince pies and to the helpers Steve Jenkins, Lynda Terry, Angie and John Simmonds. On the competitive side more than a third of the field ran less than a minute different to their predicted time with Phil Shearsmith and Tara Anglim tying on a perfect prediction and they will share the Handicap trophy for the year. Fastest run came from Tim Morgan who ran a seemingly effortless 39:45. Pat O'Reilly had the distinction of running 5:17 faster than his predicted time but still didn't claim the Lanterne Rouge!" spreadsheet showing all the info in case you prefer it that way. And here's an album of pictures. There were two items of found property; a New Balance blue & black top and a hat. Please contact Mick (see Contact Us tab). Finally thanks very much to Mick for making all the arrangements and crunching the numbers. Despite the rather dreary weather there was an excellent Hardley turnout for this popular race. Hardley results are below. You can see the full results here. Hardley results are below. Click here for the full results. Please go to our News page fror Paul Blundell's report and some pictures. When I did the report below I inadvertently omitted our most prolific parkrunner. Step forward Matt Pillinger who completed his 100th parkrun at Basingstoke on 30th November. Well done! Conditions were good for the 3rd HCCL race at Popham. Hardley results are below. You can see the full results here. After this race our men are 8th in Division 2 and our vet men (same people) are 8th in Division 1. There were two Hardley runners: Andy McGough who was 55th in 68:36 and John McKenzie who was 78th in 70.28. Click here to see John's Garmin track. A very scenic route with lots of ponies and wonderful autumn colours. The hills came as a bit of a shock by comparison with Gosport the previous week and in your webmaster's case, the modified Dave Bedford approach (no training in the last two weeks apart from races, late night on Saturday with lots of red wine and too many pork pies) did nothing to improve performance! Hardley results are below. You can see the full results here. 153 Jeremy Barber 02:01:29 +10mins! 60 people giving Hardley as their club have turned out for a grand total of 1480 times. Well done all. The most is David Gould with 56, all at Andover. Fastest are Paul Ashley 17:04 and Sue Sleath 19:35. Best WAVA age grades are Malc Renyard 87.14% and Sue Sleath 85.62%. There's a summary showing everyone in this Excel spreadsheet. You can click on an athlete's name to get to more information. Enjoy! Improved results now available below. Trouble is all the improvements result in us being placed lower down the field! Conditions were pretty well perfect for fast times. A flat course (well almost), dry underfoot, not too hot, not too cold, hardly any wind and not raining. The floods, frost and rain we have seen in previous races were just hazy memories. Also the bright sun we have seen on the sea front but that is a minor price to pay. Ian, Mark, Andy, Matt and Adrian all managed PBs. Well done. You can see the full results here. Hard luck story of the day was Sarah King who was unwell and retired after 4 miles. At least that gave Katie the chance to say that she finished ahead of her sister! What a difference a day makes. You couldn't have asked for a better morning with wonderful bright sunshine and there was an excellent turnout. The previous 24 hours of heavy rain had left the course just a bit muddy and the hill at the end was a good challenge. Hardley results are below. You can see the full results on the CC6 site (see Links tab). And here's a lovely album from Hammy. For once the men were lucky to start last becuase the rain stopped before we started. The course was a bit slippy and churned in places but that was nothing compared with the torrential rain suffered by the earlier races. The course was a good one, a mixture of grass and woodland tracks with some hills thrown in to make it more of a challenge. Hardley results are below. You can see the full results here. After this race our men are 8th in Division 2 and our vet men (same people) are 8th in Division 1. No fewer than eight Hardley members took part in the Civil Service Cross Country Championships at Parliament Hill. Six Ordnance Survey runners came back with 4 medals with Ian Smith, John Horton and Mick Anglim (who also won the individual M60 Gold) winning Over 50 Team Gold for the first time. Paul Ashley was 8th overall and Viv Alexander led the OS ladies home. Matt Pillinger however was not impressed with a slightly muddy 10k over Parliament Hill as his first X/C outing! The rain held off, the sun even shone a bit and there were none of the water features of last year. There was an excellent turnout with 23 Hardley members taking part in the 4th race of the HRRL season. The marshals were good, the parking was good and the course was good. Thank you Lordshill. Hardley results are below. You can see the full results here. Congratulations to Mark on being first Hardley member home in a new PB. And here is an excellent album from Hammy. And here is John McKenzie's Garmin log. The start on a quiet country lane suggests this will be a gentle run but the illusion is shattered when you hit the Stickle path and ordinary mortals soon start walking. After that life has its ups and downs with 1500 feet of ascent in 10.2 miles and a good opportunity to get a one mile PB in mile 4. The top of Hambledon Hill was difficult, straight into storm St Jude with needle sharp rain so it was head down, eyes mostly shut, and carry on. As always this was an excellent race and I can recommend the White Horse at Stourpaine if anyone is looking for a lunch venue next year. Hardley results are below. You can see the full results here. Read a bit more about it in this blog. There was a new course for this race in the Runningtree series. It ran along the coast and was exposed to gale force winds which made it a challenge. Hardley results are below. You can see the full results here. Conditions were difficult with strong and blustery winds, particularly on the front at the end of the race. As a result times were slower than last year. Congatulations to all who took part and special mention goes to Paul Pallister on breaking the hour in 45th place out of nearly 17,000 finishers. Hardley results are below. Click on the runners name to see a bit more detail. You can see the full results here. Annie writes, " What weather on Sunday. Although I was last my excuse was that the weather was bad and my bucket was very heavy. People kept stopping me& asking me to wait a minute whilst they went into their bag for money. People were still putting money in my bucket on the way to the station and on the train. By the time I got home I had over £160 in my bucket. The total is now £400!!! " Click here for loads of lovely pictures by Hammy. Start here for a nice sequence of Viv losing her shoe! Hardley results are below. You can see the full results here. After this first match our men our 6th in Division 2 and our vet men are 9th in Division 1. Thanks very much to everyone who both marshalled and then ran, especially if you then helped again afterwards. Hardley Results are below. For the full results please see the Solent Half tab above. Starting not far from the source of the Wye this race could be more accurately described as a trail run than a mountain marathon. However as expected from a UTMB 2 point qualifier the route should not be underestimated. The majority of the route follows the Wye valley itself though their is a cheeky little excursion into the Elan valley via mountains and around the spectacular dams. Tiff Hanley, Paul Blundell and Martin Loveless finished joint 59th in 12:18:52. You can read Paul's report and see his photo album here. Congratulations to Nick Newton who was 1st M55 and 54th overall in 3:08:42. Well done. I don't know if there were any other Hardley members there as the results are a secret. I kid you not. The website says, "We will only openly publish the top 10 finishers of each race. You will need to log in to get your times, splits and finishing position within the race. You can then choose to share this information as you see fit. They are your results and times." If anyone else from Hardley was there please let me know and I'll add you to our roll of honour. Well organised and, as always, an enjoyable and scenic route but a bit too warm this year. Hardley results are below. You can see the full results here. There was one Hardley runner for this year's event held in the grounds and parkland of Downton Abbey. Step forward David Gould, 76th in 49:01. There was a good Hardley turnout for the first CC6. It rained and that made it a bit slippy but the going was firm underneath. Thanks very much to Eastleigh for a well marshalled course. Hardley results are below. Particular credit goes to the ladies who turned out in greater numbers than last year and are now 3rd placed team. Well done and please keep up the good work. The full results are on the CC6 website (see Links tab above). And here's a lovely album of pictures from Hammy. Three out of the first five finishers were from Hardley. And Sue Sleath was 3rd lady as well as first FV50. Well done! Hardley results are below. You can see the full results here. It was a warm humid morning, a huge contrast with the cold, wet weather for the 2012 race. The weather clearly did not suit the runners as 50% were inside 2hrs compared with 59% last year. Congratulations to Paul Pallister who was 4th overall and first MV40. Hardley results are below. Honorable mention also goes to Brockenhurst Chapter associates, Dave Turnbull of Bourton Roadrunners, 474th in 1:56:20 and Terry Dawson, Serpies, 714th in 2:07:47. You can see the full results here. This run is a little gem. 9 miles of scenic countryside with tracks, fields and woods, lovely encouraging marshals and 1000 odd feet of hills. All that followed by buffalo burgers, Ringwood best and scrummy and healthy (it had carrot in it) cake. Well done Sue who was third lady and first supervet lady. Hardley results are below. You can see the full results and read more about the race here. This is a very scenic (i.e. hilly) race orgainsied with charactertistic enthusiasm by Axe Valley Runners, proprietors of The Grizzly. There are three options: 8, 13 or 18 miles. In the 18 mile race Martin Lovess and Tiff Hanley were joint 3rd in 3.54 and Tiff was the first lady. Well done! You can see the full results on the AVR website Martin reports, "The 18 mile route does an inland semi-circle over the highest hills in South Dorset before emerging at West Bay, from there it’s a 7 mile run along the coast path, taking in Golden Cap which is the highest point on the South Coast We were very fortunate with the weather - it started raining about 2 minutes after we crossed the finish line but still very windy out on the Dorset coastline, few times blown off the paths but fortunately inland rather than over the edges!" We had full teams for both the men and the women. Well done to all concerned. Adrian Mudle reports, " The race, like yesterday's Test Way relay, started off with a nice sunny morning, only to be overcast and threatening rain by the time of the start, ideal running conditions, though we could have done without the stiff breeze on the return leg, so much so I was a bit surprised to find one of the Totton runners running in the lee of myself, did not think I was large enough to make a difference, I believe most of the team managed a personal best for this race, I know I did and managed to beat my own target which after running the Test Valley the day before was what I had hoped. Congratulations must go to Katie who managed to knock over 5 minutes of her Overton results." Just two Hardley runners in the nice local 10K, so far as I can see, both near the top of the field. Well done to Mark Causebrook 6th in 37.47 and Sue Sleath 17th (3rd lady) in 43.15. You can see the full results here. They don't show clubs so I may have missed someone. If so please let me know. Adrian Mudle reports, "The Overton 5 mile was blessed with ideal running weather; the rain held off and I have been told it was not hot like last year, though with last year's weather I find that difficult to believe. The race was well supported by Hardley runners, and the locals with their deckchairs outside their homes cheering everyone on. I'm sure this must have helped as the hill did not feel so bad the second time around. Well recommended and runners should not let the distance to Overton put them off next year, as it not much different time wise to get to the Victory 5." The weather was lovely for the 12 Hardley Runners who made the trip to Corfe and there was no sign of the streams on the hilly paths or mud in the dips from previous years. This was a new course as part of the stairway to paradise has fallen into the sea and the path is closed. As a result we went a bit further along the coast to a quarry, then St Adlem's Head and the usual steps both down and up but with a long uphill slope instead of the last stairway. There was some debate as the whether the stairs were preferable to the long slope with opinions split about evenly. All in all the new course was excellent with encouraging and helpful marshals and lots of water stations and as it was a new course we all got PBs. Well done Poole. Hardley results are below. You can see the full results here. There was a high turnout, both from Hardley and overall; in fact it was (I think) a record number of men though not quite a record for women. I wonder who gets to look after the kids in the summer holidays? The weather was pleasant though a tad sticky. After a long dry period the going was firm with none of the sticky bits of previous years. The course was three laps and the hill seemed to get a bit longer and steeper each lap. Rumour has it that it is cunningly computer controlled and does, in fact, get longer and steeper each lap. The course was well marked and well marshalled. Thank you Winchester. Hardley results are below. The full results will be on the RR10 website (see Links tab) on Thursday evening. And if you click on the team photo you will see a lovely album of photos from Hammy. Matt Pillinger writes, "Finished in 2:41:48, I was slightly disappointed not to go under 2:40, but still 8:45 quicker than last year. The L100 runners started at 6.30 on the Friday evening. The Friday night was pretty well perfect with good visibility and a lovely moon. Saturday dawned sunny and humid and it was getting hotter hotter and more humid at the start of the L50 at 11.30. In the evening there was thunder and heavy rain which was cooling and welcome. But you can have too much of a good thing and we did; there followed nine hours of continuous rain with over three inches in all. Streams appeared where none had been and visibility was poor and navigation difficult. All in all then it was challenging conditions but that's par for the course. We had one Hardley member in the 100, David Gould who completed the race last year but retired at Dalemain this time after 'only' 60 miles in 18:13:57. You can see his report and analysis on his facebook page (not sure if this will work if you are no a Facebook member) The race was won by Stuart Mills in 22:17:50. He was 45 mins ahead of the second placed runner and at 50 his age was more than the combined ages of the second and third runners. Incredible! You can read his blog here. In the 50 we had 5 Hardley members, plus Dave Turnbull who also ran with us two years ago. Kim and Tiff were new to the race; the others had all done it before and wanted to improve. For most of us it was not to be with only Dave beating his previous time. This was all the more creditable as he was slowed down by running the first 20 miles with Jeremy Barber who was struggling with the heat and retired after 27 miles at Kentmere. Martin Loveless set off strongly but also had problems with the heat was was overhauled by Tiff Hanley and Paul Blundell. In the battle for the line Tiff put in a final surge and beat Paul by two seconds. Kim Cotton finished in style, last over the line but ahead of over 100 who retired. Well done to all concerned and particularly to newcomers Tiff and Kim. John McKenzie writes, "Waltham, a name believed to be of Saxon origin, walt meaning wood and ham meaning home. Despite having to run up and over a series of short hills that Saxons forgot to mention, Hardley gave a good account of themselves at the Bishop's Waltham 5 mile road race." Hardley results are below. You can see the full results here. A beautiful course through the New Forest, mostly on gravelled tracks with some tarmac sections, plenty of parking, loos, and water, squash and a hosing down at five miles and at the end. Not much chance of a PB due to the blistering heat! John says, " Lovely and warm, after half an hour it became a Sunday training run with a bit of effort put into the last mile." You can see his Garmin trace here. Hardley results are below. You can see the full results here. Martin Loveless writes, " Starting and finishing at Charmouth in Dorset, and classified as a grade bm fell race, the 8 mile course includes the ascent of Golden Cap which is the highest point on the South coast. Glorious weather, with not a cloud in the sky, meant a stark contrast from last year when the race had to be cancelled due to the amount of rain cutting off Charmouth from the rest of the world. All the Hardley contigent in this years race made the most of the weather by camping at Bridport and celebrating in true Hardley style on the Saturday night, followed by a social run on Sunday morning and a walk in the afternoon along the Dorset coastline. Definitely one for the diary next year - weather permitting!" Hardley results are below. You can see the full results here. And here are a few pictures which Mark Lee took on the Sunday walk; talk about vertiginous! Congratulations to the Hardley Runners who took part in this 10 mile relay at the Southampton track. Our A team ran well to finish in around 6th position out of 24 teams. Congratulations and thank you also to our ten runners who represented the B team and finished 19th. As before it was an exciting and team spirited evening. Thank you to Hannah White of Romsey Road Runners for organising the most successful Miles of Miles event so far. The sun shone on the 200+ runners in contrast to the torrential rain of last year. The relay was won by Southampton AC in a blistering 49 minutes and they will have the honour of hosting next year's event. Hardley resultsand the overall summary are here (Excel spreadsheet). It was an excellent day for the 25 mile Purbeck Plod. A huge contrast with last year when it was very wet and horribly muddy. Sadly the wet weather last winter caused on of the steep climbs on the coastal path to fall into the sea so there was an alternative route to Kimmeridge via Swyre Head. There was a chilly sea mist for the first half and bright sunshine for the second. This is a Rambers event which takes runners. They looked after us very well with frequent checkpoints with squash and biscuits and a tasty pasty at the finish. In true ramblers' tradition times are irrelevant, to have taken part and enjoyed it is what is important. Hardley members who took part (in alphabetical order) were Andy and Jeremy Barber, Paul Blundell, Ian Hawker and Martin Loveless. You can find out more about the event here. Adrain Mudle writes, "It was a great day, and from what I've heard nothing like last years weather, to be honest this was the first time I can say, since I started running (last July) that its been hot (warm), around 24C which must be almost a record on its own. Running past the same pub twice was a temptation of liquid refreshments, as today was one of the days we needed it most, and while most of the Hardley members that I meet up with thought it was a good race, now it was over, I have not seen such a hot and sweaty bunch (perspiration for the ladies) of runners. I think the heat reduced the chance of many PB's, good job I do it for the fun of it. Hardley results are below. You can see the full results here. An excellent course with the surface in good condition, good weather and enthusiastic and supportive marshalls. What more could you want? Cake, I hear you say. Yes, there was cake as well and it was very good chocolate cake. Well done Hedge End, Halterworth and Running Sisters. The only slight drawback was sudden gloom on entering woods which caused a couple of falls when people hit tree roots. Oh and the elephant in the room was three polar bears. Does anyone know what they were about? Special mention goes to John Simmonds for good sportsmanship. He abandoned his own race to accompany a young injured runner from another club, back to the start. Well done John! Hardley results are below. The full results are on the RR10 website (see Links tab). And here's a lovely album from Hammy which proves that there were polar bears. A cool but dry summer's day made it ideal running conditions for the Sway Carnival 5 which kicked off the Runningtree Series 2013.Hardley results are below. You can see the full results here. What with the distance and the poor weather, turnout was down to 17. The small field gave many of those who came their best place of the season so far plus, of course, extra points in the race for the Geoff Mills trophies (see above). The course is good and was a bit drier than last year and the Stubby marshals were very enthusiastic and supportive and included a couple of marshals who thanked the passing runners for attending; the first time that has ever happened to me. The rain eased off but the wind didn't and somehow every turn seemed to be into the teeth of the howling drizzle! But that just helped to keep us cool and it was a good run. Hardley results are below. The full results are on the RR10 website (see Links tab). Adrian Mudle writes, "As far as I'm aware I was the only Hardley member running this event, which for a commercially organised (Votwo) event on the National Trust Kingston Lacy estate, I was not aware what to expect, however it was well organised, and a good route, even though I was not expecting any brilliant results, I actually managed a PB by a few seconds, and even managed to conquer all the hills, thanks to Chris, Sam and Neil's hard work, ended up with an official result 2:00:23, 133 out of about 300 runners, still looking for sub 2 hours, mind you if I took away the delay crossing the line I would have made it. Next time!!!" You can see the race website here. Endure 24 is a 24 hour race run over woodland trails in the grounds of Wasing Park near Aldermaston. There are classes for solos, pairs and teams. Two Hardley members were in a ladies team and three in a mixed team. All in all it was an excellent event. You can read a more detailed report and see the times on our News page. So far as I am aware Terry Earney was the only Hardley member running the marathon this year. He came 374th (first M65) out of 494 finishers in 5.05.11 which is pretty good going on a tough course and a very hot day. You can read his full report on our New page - see tab above. Stop Press - Terry was not the only Hardley runner. Guy Brown, fresh from his 100kms the week before ran 3.58.23 and came 78th overall. Well done both. Lisa Lewis did the half and finished 172 out of 446 in 2:05:54. According to the detailed information on her results page Lisa averaged 10121.00mph. Looks like a certain place in the next Olympics! Romsey Road Runners were delighted to hold the 5 Mile Beer Race in glorious sunshine and with a record 315 entrants! The club’s members turned out in force to support the event, ensuring the safety and enjoyment of the runners around the roads of Braishfield, and making sure that the beer was flowing and the cake was in ample supply. Hardley results are below. You can see the full results here. And here's a photo album by Hammy. 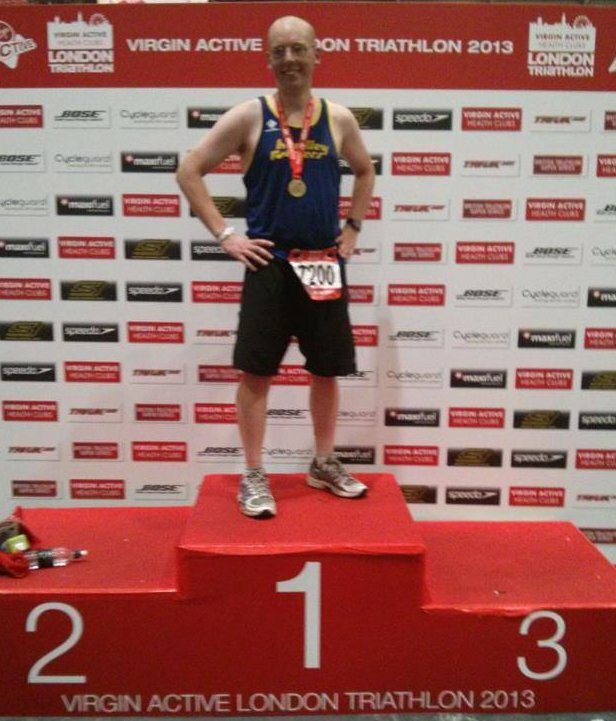 Guy Brown ran the 100km London to Brighton Challenge in 11 Hrs 43 minutes and came 20th out of 321 runners. Well done Guy for an excellent result. There were two Hardley runners, Mark Causebrook who was 10 in 17:33 and Alan Doney who was 27th in 18:47. Well done! You can see the full results here. 41 members turned out for an excellent course and a very pleasant evening. Thanks very much to our New Forest friends for a new course which started on grass followed by two loops in the woods, somewhat unulating and a bit muddy which made it more challenging. Hardley results are below. The full results are on the RR10 website (see Links tab). And here's a lovely album of photos from Hammy. Thank you to all the members who turned out for the last race of the HRRL season. Hardley results are below. You can see the full results here. Sue Sleath was the only Hardley competitor this year in this scenic 33 mile trail race. She was first lady and 26th overall in 5:03:51. Well done! You can see the full results here. A deceptively hilly run. Always a good one as the entry include the zoo so you can picnic afterwards and look at the wildlife. Hardley results are below. You can see the full results here. Where did the summer go? After a lovely bank holiday it was back to damp and chilly for the second RR10 but that did not deter Hardley and we had an excellent turnout with 38 members competing. Thanks go to our Totton friends for a well organised race. The course was good and those in road shoes had an extra challenge as the rain had left some bits quite muddy. Hardley results are below. The full results are on the RR10 site (see LInks tab above). And here's a lovely album of photos from Hammy. Like the HBT5 the previous day, the Houghton trail race a small local race with friendly and welcoming organisers and excellent bacon butties and cake. There's beautiful downland countryside, the river is very pretty and it is definitely worth trying next year. Hardley results are below. You can see the full results here. Lots of members do the parkruns at Eastleigh, Southampton, Netley Abbey, Andover and the new one at Winchester so I thought we'd dip into the results. At Netley Abbey 12 runners have done 39 runs with John McKenzie the highest with 12. . At Eastleigh 24 runners have done 116 runs. The highest is Mike Roberts with 26. At Southampton 25 runners have done 143 runs. The highest is Charles Fox with 24. At Andover 2 runners have done 71 runs with Jeremy Barber the highest at 36. Best men's age grading is Malc Renyard (M65) with 83.28% and best women's was Sue Sleath (W45) with 83.25%. This is the all comers highest age grade for the Southampton run. Sue is also Hardley's fastest woman at 19.54 while fastest man is Paul Ashley at 17.04.This week's results are below. Click on a runner's name for more information. Three of our runners went on to the Hurstbourne Tarrant 5, an excellent 5 mile trail race on the side of the Test Valley which is only 19 metres of ascent short of being an official fell race. As well as two killer hills, the race featured some of the best bacon butties and cake and is definitely recommended. David and Jeremy were two of four Andover parkrunners who jogged the six miles to Hurstbourne Tarrant after the parkrun. Andover parkrun hope this will become a tradition; it was definitely an enjoyable morning. Hardley results are below. You can see the full results here. Conditions were pretty well ideal for this year's London Marathon. Huge crowds cheered on the thousands of runners. Congratulations to all our Hardley competitors. Hardley results are below. Click on a runner's name to see their splits. On a personal note, I was a spectator for the first time, a very different experience from running, and managed to see the race at miles 9, 11, 19 and 25. I was following a friend, ex-para Mike Ellicock who finished in 3:25:21 and managed to knock over 15 minutes of the world record for a marathon carrying a 40 pound pack. There were two Hardley competitors. Sue Sleath was 3rd lady and 21st overall in the 20 in 2:54:50 and David Gould was 63rd in the 40 (sadly two laps of the 20 this year but back to normal next time) in7:51:22. You can see the full results here. The best laid plans ... Lots of runners arrived in good time for the ferry only to find that it was cancelled. Thanks very much to Ryde Harriers for delaying the start so we didn't miss it. The course was good, the hills were challenging but it was straight into the wind on Tennyson Down and it was a strong and bitter wind. Congratulations to Mike Cummings who was 3rd and to our men who were first non IoW team. Hardley results are below. You can see the full results here. Oh and the ferry was cancelled on the way back as well. It makes you realise what our IoW friends have to put up with. This is the first in a series entitled "Might Contain Nuts". The truth is that there's no might about it. The five Hardley members who braved Arctic conditions on this 33 mile ultra in the Black Mountains are definitely nuts. Congratulations to Tiff Hanley (2nd Lady of a Certain Age), Sue Sleath, Martin Loveless, Ian Hawker and Paul Blundell. Paul writes ..."Runners were skating slipping and falling all around us and the strong wind was trying to blow us down the mountainside away from where we were trying to head. The huskies were trying to drag there owners over the ice and one lady was crouching over her wire haired fox terrier trying to warm him up....." Read more and see the pictures in Paul's report. We had two Hardley finishers. Matthew White was 670th in 1:30:20 (chip time 1:29:28) and Matt Pillinger was 2713rd in 1:47:44 (chip time 1:44:01). You can see the full results here. Thanks very much to everyone who helped or provided a helper and ran. Hardley results are below. For the full story please see the Exbury 10K tab above. What a contrast with last year's lovely weather. This year was cold with a biting wind and flurries of snow and the ground was slippery and wet. But that did not deter Hardley Runners. As always it was a great race. Wonderful happy and encouraging marshals, music, mystic mantras and, of course, the boggy bits. Hardley results are below. Note some times include a few seconds guesswork. You can see the full results here. And here's a photo album. A lovely run in the Wiltshire countryside along the banks of the Avon. The second 5 miles is slightly harder than the first, but once you see the Cathedral spire you know its down hill all the way back. Friendly marshals, excellent pre and post race facilities, lots of free parking and a decent t-shirt. There was a good Hardley turnout for this HRRL race. Hardley results are below. You can see the full results here. What an excellent race! The first nine scenic miles were on good forest tracks and I began to wonder why I needed the trail shoes. The next four were the reason with energy sapping mud and hills. The arrangements at Brockenhurst were good, there were lots of marshals to show you the way, a good goody bag and lots of lovely cake. Oh and the event raised a tidy sum for Oakhaven Hospice so all in all it was a good thing. Hardley results are below. Particular congratulations to Kerry on completing her first half marathon. Well done! You can see the full results here. Retiring CC6 Captain, Jenny Jewell writes, "It was a blooming cold morning at Fleming Park and quite a low turnout overall but those that did run seemed to enjoy the undulating course. Neither Dave or I ran, since Dave pulled a calf at the last CC6 and I have had a cold all week, but we went to watch especially as it was Dave's son Scott's maiden CC6 race and he finished a very respectable 40th. We would like to thank all those who helped us during our CC6 captaincy, particularly to Rose McElhenny who has braved harsh conditions to diligently collect in the scores most races, and to those who helped in staging our own races. We wish Ian Ordish all the best in his new role as CC6 captain and he will undoubtably do an excellent job." Here is an excellent picture album from Hammy. Hardley results are below. The full results are on the CC6 website - see Links tab above. Hardley results are below. Click on the name for more information. You can see the full results here. What a lovely run. It was cold and the ground was mostly frozen which meant the going was a bit tricky where it was poached by cattle. They had to omit the bog this year; a bit disappointing for some but well outweighed by not having to get soaked with 8 miles to go. It is an excellent course with hills that are challenging but not too long and scrummy (and large) cakes afterwards. Only three Hardley members this year, let's hope for more next time. Hardley results are below. You can see the full results and pictures here. I'd echo everyone for their thanks to the marshalls. It was hell out there, I was frozen but I was running to keep warm so it must have been worse for the marshalls. Every single one, of which there were many, were friendly, attentive and helpful despite the conditions. A lasting memory of a forgetful day! Thank you again." Five Hardley members were well up the field and Sue Sleath was first Hardley member home and second lady. Well done! "The intrepid 5 set off in the rain for what must have been some of the worst conditions to contend with in a trail race. We soon got wet and this progresssed into extreme cold. The fingers were numb with icy rain and wind hitting the face on top of those hills, oh those hills!! At the top of Butser Hill we passed into the mist having run through thick mud and torrents of water. The drinks stops were a salvation, with delicious cakes and coffee at 18 miles! The marshalls were suffering as much as we were. However, the caffeine intake spurred me on to reach the finish and finally begin to feel my fingers again! A great challenging trail race superbly organised by Portsmouth Joggers." Hardley results are below. You can see the full results here. And here are some pictures. Thanks to Totton, with help from Lymington Tri and New Forest, for hosting todays CC6 – have had some really great feedback about the course and especially about the cakes at the end. Good turnout, despite the weather. Here is an excellent picture album from Hammy. Hardley results are below. The full results are on the CC6 website - see Links tab above. Parking was a difficulty and conditions were damp amd misty but otherwise all was fine. Our men were 7th in Divsion 2 and now lie 8th in Division 2 overall and our vet men (same people!) were 6th team in Division 1 and also lie 8th overall. Thanks to everyone who turned out to ensure that we didn't get relegated and to Ian for rising from his sick bed to encourage us on. Hardley results are below. You can see the full results here. Two Hardley men crossed the Solent for the Ryde 10. Well done. Sadly this was not enough for a Hardley team for this HRRL event. The HRRL next race is the Bramley 20 - an ideal race for anyone training for a marathon. Hardley results are below. You can see the full results here. Conditions at Boscomb were very good, if somewhat chilly. Congratulations to Malc (on his comeback race) and Chris on coming first in category. Hardley results are below. You can see the full results here. There was an excellent Hardley turnout for the Stonehenge Stomp on a lovely day. This is a walkers event so details are not recorded. Meanwhile in Romsey four members did the Romsey 5. Hardley results are below. You can see the full results here. Because of the bad weather the mugs did not make it to the race. They have now arrived and Paul Blundell has them. He will bring them to the AGM and to training and the Meon Valley Plod. Please contact him to bag yours email p.blundell AT btinternet.com (replace AT with @). A bit of a cold day but that didn't stop 21 brave Hardley Runners from turning out. Considering the amount of snow on the ground it all went very well. The roads were cleared and well treated with salt so the gentle snow during the race was not a problem. There were loads of encouraing marshalls. Well done Stubbington for putting on a good race in very difficult circumstances. Hardley results are below. You can see the full results including age gradings here. Slip 'n' slide through amazing countryside. There was a good Hardley turnout on a lovely sunny morning for this excellent 10 miler. This report on Runners World just about sums it up. "Fantastic event!!! The whole event is amazing the organisers have done a great job, a big shout goes to the marshalls!!! The post-race cakes and medals made all the hard work worth it!!! The Course: Very challenging, massive hills both up & down and an abundance of mud and water - energy sapping fun!!! Paul Blundell adds, "A sunny but cold and icy day greeted competitors for this years rough and tumble. The road outside the village hall was icy with at least one competitor slipping and falling even before the race started. The race director gave his usual introduction warning the conditions were possibly the worst underfoot they had experienced for the race. Once underway, we soon started running along a flooded track and conditions seemed to get more challenging as the race went on, I nearly went over several times despite wearing studs and I saw at least one runner lose a shoe. The final couple of miles saw icy puddles you could not go around and were almost knee deep in places. I was please to be only a minute slower then last year. Sue Sleath excelled and was 3rd lady. All in all a great race with real off road conditions…"
It was a foggy and gloomy morning but the conditions were pretty good. A fallen tree meant a minor course change but everything was very well marshalled and all in all it was an excellent race. Here is an excellent picture album from Hammy. Hardley results are below. The full results are on the CC6 website - see Links tab above. Our vet men were 12th team and Mike Smith was first MV60. Well done. Hardley results are below. You can see the full results here.